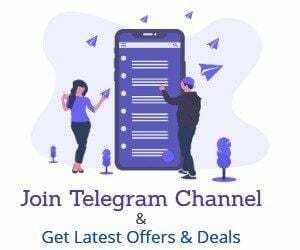 Axis Bank ASAP Offers- Hello Guys, here I am with a New Trick to get a lot of Discounts and Vouchers You can Open Axis ASAP Account Online Without Documents and Get A Range of Exiting Offers. Axis Asap is offering Rs.150 Bookmyshow Vouchers on Account Opening, Up to Rs.250 off on Bigbasket, up to Rs.2000 off on Flights and Many More.You just need to Enter Your PAN Card & Adhaar card details to Open Account and You Will Get an Axis ASAP Account Instantly. Best Part You Will Get A Virtual Card that You can use To Get Free Hotstar Account & Netflix Account.You don’t need to keep balance in Axis ASAP account as it Allows Zero Balance in Your account.You will also get interested on your balance too.You can Also use Tez Refer & Earn + Phonepe Refer & earn (After 24 Hours)On this Account. 2.Now Enter Your Name in the Field. 4.Now Agree to The Terms & Click on Next Button. 5.You will Receive OTP, Enter OTP on the Field and Proceed. 6.Now You will see Your Registered Details fill Some Additional Details asked by AXIS ASAp. 8.On Next Page tap on ” I AM TAXPAYER IN INDIA ONLY”. 10 On next Screen, You Will Get Your Virtual Debit Card than Can be used on International Sites too. 1.Once You download App from the link, You will Need to Login with the mobile Number Verification. 2.After Login Open App and Set an MPIN and proceed. 3.Now You will see a Deals Section, Open it and here You can get Your Unique Vouchers. My phone is not registered with aadhar..What should I do.On which no. Would I get the top? Axis asap link you provided was not working every time the error on the page occurs. it ask to enter the same number registered with aadhar. when i enter a different number it shows this message. how to solve this? After registration how much time required for physical debit card for delivery &can i. 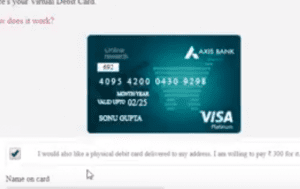 Use axis virtual debit card for tez???? Mera tez me bank link nhi ho raha hai……… Waha ye show ho raha hai ki ” the bank doesn’t exist” what am I do…? Bhai 6 din hua open kiye hu kahi bhi link nhi ho pa raha h ye bank…. !